Travelling with children can be trying even if you are not doing all the driving. While Savaari Car Rentals takes care of navigating traffic, here are some simple ideas to ensure your kids don’t drive you crazy while on your next road trip! Make the trip an adventure. Print out a trip map off of google maps that you can track with your kids. You can mark out points of interest, distances between stops and even have a few quiz questions ready about the destinations along the way. For instance, you can ask them “How many years did the building of Taj Mahal take” while enroute to Agra. The answer by the way is 22 years! When your kids answer questions correctly they get a certain number of points and can get a toy/snack for having cracked the question. If you have time to research your holiday destination, you can even print out pictures of places of interest and have them accompany the map. The game not only builds map reading skills but also builds a sense of anticipation and discovery, so important to keeping kids from getting cranky while you are on the road. Spend a couple of hours creating an I-Spy jar with any old transparent bottle – say a gatorade bottle and some super glue. The whole idea is kids turn the jar around and shout out every time they spy or find a new object inside the jar. They can also tick items off of a list or note down all the things they find inside the bottle, hidden amidst the rice. 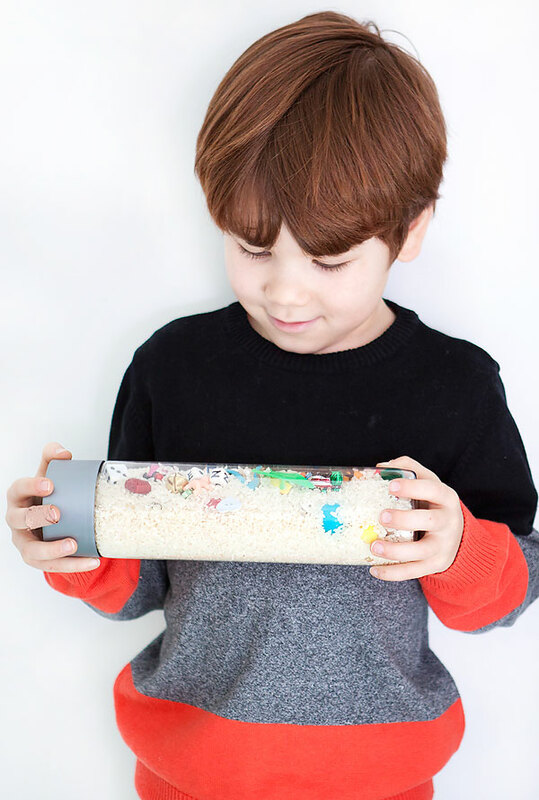 The internet abounds with fun and creative ideas to create an I Spy bottle, but the easiest one is filling the bottle with white rice and a number of small knick-knacks. You can hide old buttons, coins, toffees, birthday candles, dice, paper clips, old keys, toothpicks, clothespins, screws, hairpins, crayons, alphabets/letters from a scrabble game, inside the rice. And the jar is sealed tight with glue so it is a safe, fun, non-messy way to keep the children entertained whenever they get bored. Involving the kids in creating a journal is a great idea to make memories and keep them engaged. Buy a scrapbook or traditional photo album before you begin your road trip. Make sure you pack paper, buy a scrapbook, markers, crayons, glue sticks, tape, and invest in an instant polaroid camera to make this even more fun. If you have more than one child, assign responsibilities to each of them. For instance, one child can be in charge of taking photos, another can maintain a simple diary of what happened during the journey, and the sights they see. The kids can also collect souvenirs from the attractions. You can either buy them key chains, and knick knacks from the places they visit, to put into the scrapbook…or children can pick out their own memorabilia. Remember how much fun you had finding the perfect shells off of a beach, or the smoothest pebbles? The magic of creating your own diary never gets old and you can relive the excitement of your holiday once you come back! Create a gift box that keeps on giving! Buy a dozen cheap toys like stickers, magnifying glasses, noise makers, bubble blowers, dolls, plastic figurines, marbles and balloons (if your kids are old enough to play with them safely), laser pointers and magazines with scissors – and wrap each of these items individually. Pack them and have your kids unwrap them as they go along. Half of the excitement is in guessing what each gift wrapped item could be and unwrapping them! Preschoolers can be engaged for hours with colouring and stickering books. And older kids can create their own dream catalog by having them cut out their favorite pictures from magazines.